There are lots of things to marinate tofu in but, to maximize flavor, you can always follow one approach for good results: water out, marinade in. If you don’t get out all of the moisture in the tofu, two things happen: the marinade can’t get all up in there, and the marinade gets all watered down. 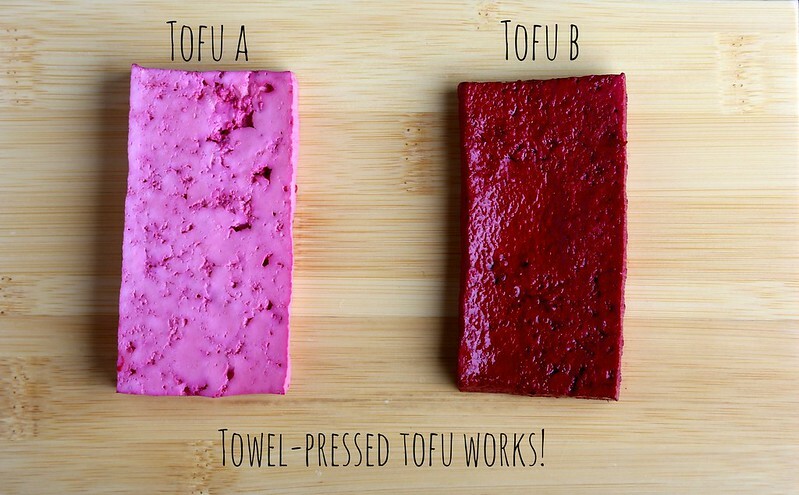 Don’t do this to tofu … cut it, then towel press it! Be like Tofu B. This marinade is a chunky+spicy blend of sambal, ginger, garlic, toasted sesame oil and other stuff. The tofu is marinated, then transferred to a hot cast iron pan to develop a little sear, then the marinade is dumped into the mix to slightly reduce and make a luscious sauce to serve alongside slightly wilted bok choy. Serve it with rice or noodles (or even mashed potatoes!) and a little vegan kimchi for some funky crunch on the side for a super fast+delicious weeknight dinner! Combine all marinade ingredients except for the tofu in a medium-sized glass pyrex. Place the properly cut and pressed tofu into the marinade, flipping to cover on both sides. Place into refrigerator for a few hours, flipping after 2 or 3 hours to ensure even coverage. Preheat a large cast iron pan over medium-high heat. Place the tofu into the hot pan and allow to brown on one side (no more than 2-3 minutes per side). Flip and repeat on the other side. Remove the tofu, then pour the remaining marinade into the cast iron pan. Allow to sizzle until slightly reduced, about 3 minutes. Remove from heat. Place the bok choy into an air fryer set at 350 until slightly wilted, about 5 minutes. You can alternatively wilt the bok choy in a hot pan with a little oil. Distribute the tofu onto two plates. Drizzle the reduced sauce over both. Add the bok choy and rice/noodles as desired, along with sesame seeds, sliced scallions and kimchi. Serve immediately. I think there is a typo “1 piece of thumb-sized vinegar” should be ginger. Thanks for the recipe! ha! Good catch, thanks Hannah. It’s fixed! Looks amazing, I love tofu! Place the tofu in the hot cast iron pan without any oil? It won’t stick? There is toasted sesame oil already in the marinade. Thanks for sharing Erin. I love ginger tofu so much but haven’t tried it with air-fried bok choy. Will test it out this weekend.